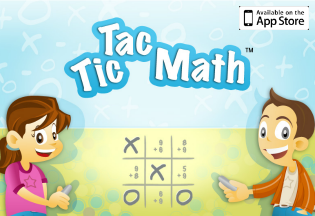 Looking for some simple practice with addition and subtraction facts to 10? 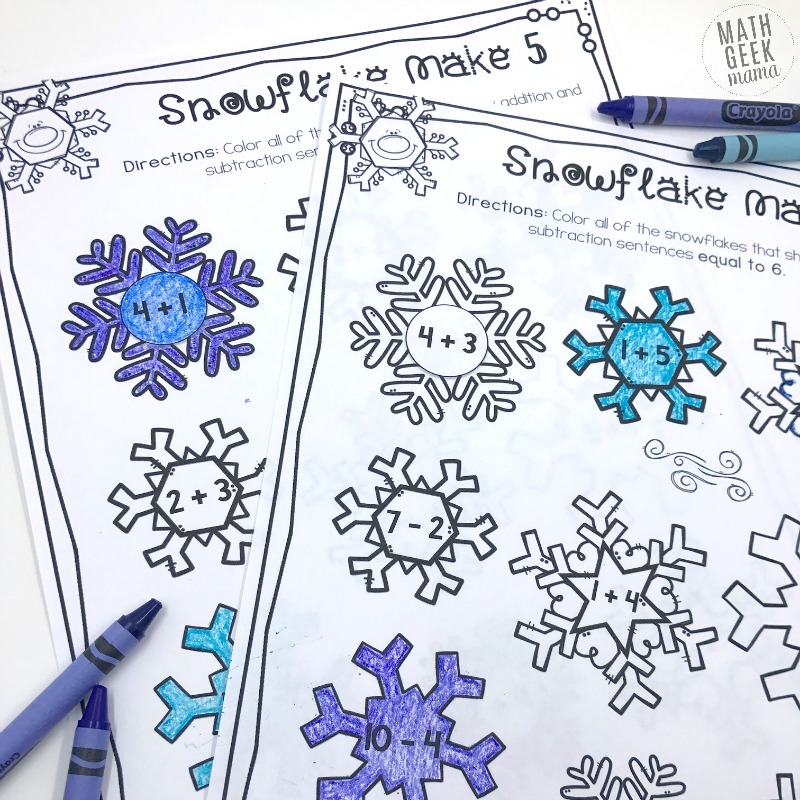 These adorable snowflake pages are the perfect kindergarten winter math challenge! Providing kids with an opportunity to learn the facts for the numbers within 10 will help them as they begin to move on to larger numbers. Knowing these facts and strategies to solve them helps provide a foundation. These simple and low-prep coloring pages are so cute, and a really easy way to see lots of different ways to compose and decompose the numbers from 5-10. And that’s it! 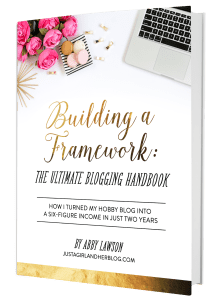 Super easy and low-prep! 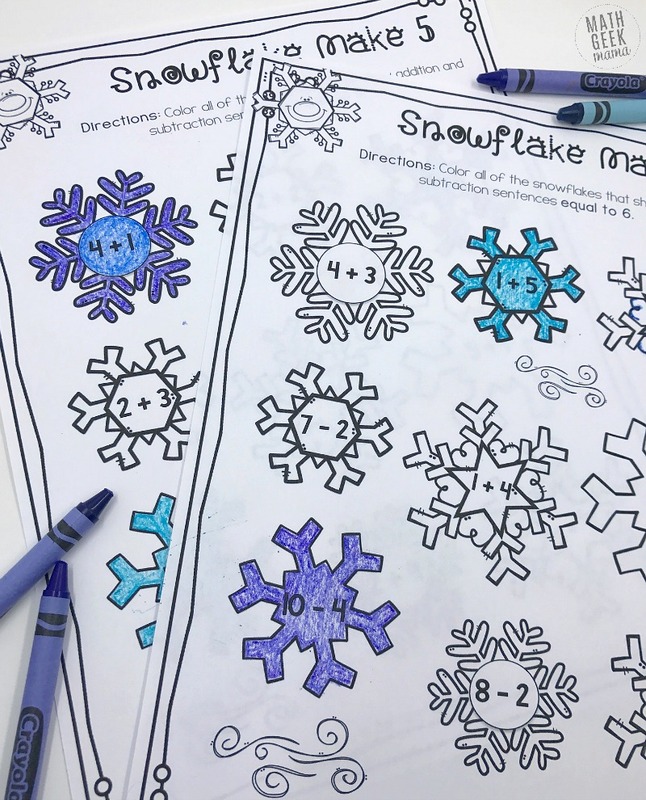 These snowflake coloring pages are pretty self-explanatory, but I’ll explain how to complete them, as well as give you some ideas for extension and discussion. First, there are 6 pages included in the download, one for each of the numbers from 5-10. Each page focuses on addition and subtraction facts for a specific number. 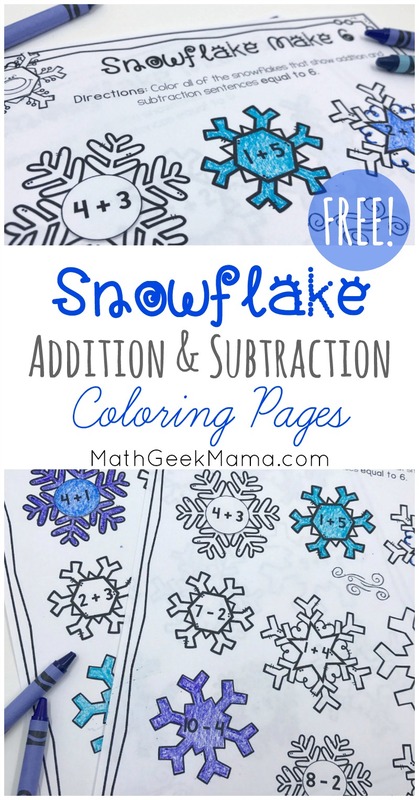 For example, on the ‘6’ page, kids have to color all the snowflakes with addition and subtraction solutions equal to 6. This helps kids see lots of different facts for a single number on one page, helping reinforce the idea that there’s more than one way to get that solution. It also helps them see different ways to compose or decompose that number, all on one page. There are several ways you could incorporate this into your lesson as well. You could use these as a whole group activity, with each child working on their own page independently. Or you could put kids into small groups and give each group a different number to work on. While this looks like a simple math coloring worksheet, I would encourage you not to give it to kids as merely “extra practice” or “busy work,” but to use it as a springboard for meaningful math discussions. For example, after completing one of the pages, ask students to list the different ways they see to “make 6,” (or whichever number you’ve worked on). See if they can find a pattern! Then ask what other combinations they can find that aren’t shown on the worksheet. On the back of their paper, they could try to write out all the different addition and subtraction problems they can think of to make that particular number. You could then ask if students can create a number sentence with 3 numbers that’s equal to that number (or more!). What other ideas do you have for extension or discussion? Share in the comments! 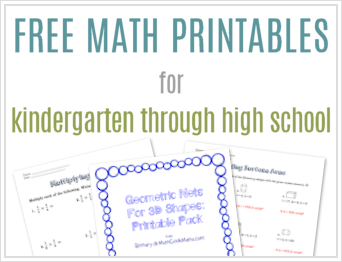 And if you like this activity, be sure to check out my set of addition and subtraction mazes. 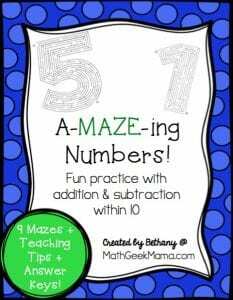 These fun, interactive worksheets challenge kids to learn addition and subtraction facts to 10 as they make their way through each maze. 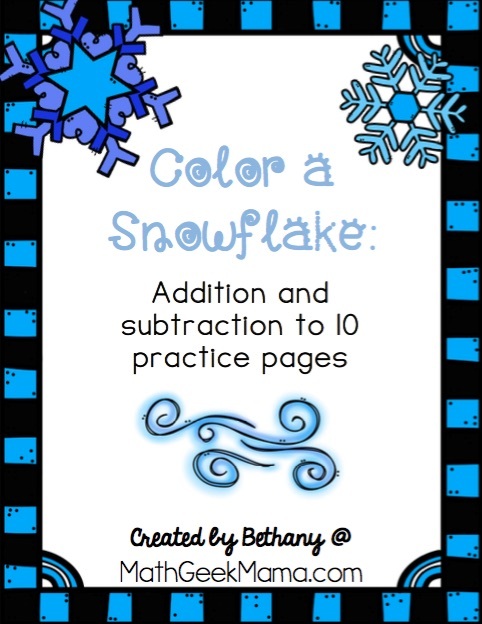 And of course, be sure to grab the fun, snowflake addition and subtraction pages! Enjoy!